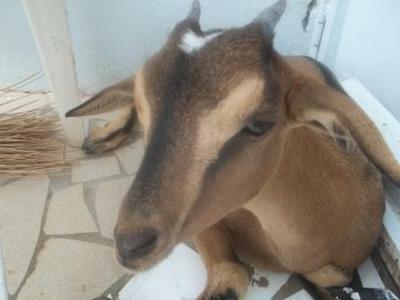 This is the story of how me and my family got our pet goat. One day I asked my mom and dad "Can we go to the sand dunes?" The sand dunes is a place were me and my mom, dad, sis, and brother would go to have picnics, it was all sand and an awesome place for sliding down dunes and exploring by ourselves. Anyway my brother and sis loved going there also, so we got our parents to agree, so as soon as we got there we went to our favorite picnic spot and unpacked everything and sat down to eat. After we had eaten my older brother asked, "Can me, Anna, and Rachel go explore some more?" My mom and dad agreed, but said we would have to come back when they called us. I was by myself when I spotted a baby goat at the bottom of a sand dune. For some reason I cried out "Lone goat!" My brother ran down to see it, thinking that it would run away, but instead it just sat there. As soon as he was down there he started petting it. I went back to tell my parents that there was a goat just sitting there. we all came down to look at it my dad examined it and said she had a hip bone out of joint. My little sister asked, "Can we keep it?!" My dad and mom said we could take care of her but, warned us that she might die. The next day i ran to my dad, "Is she still alive?" I asked worriedly. My dad said, "Yes!" and smiled. That afternoon my dad took her to the vet to get some shots, when she came back she looked terrified, but then she calmed down when she saw me, Anna, and Nathan. That afternoon we let her out in our yard and she started eating my dad's jasmine flowers with great relish, so from then on we called her Jasmine. Thank you for sharing your story with us, Rachel. You sound like my daughter, she rescues every animal she finds. I hope you goat is still doing well.